At Combo Breaker in St. Charles, Illinois, two countries clashed to prove who was the best in the tournament’s own namesake. 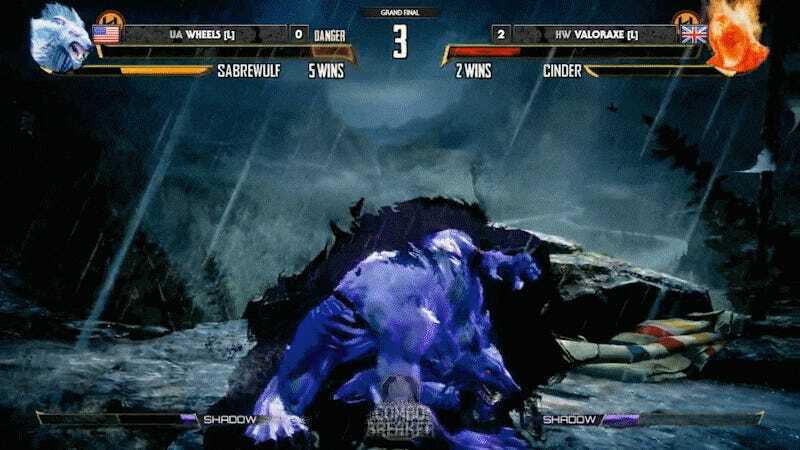 Valoraxe, a player from the United Kingdom, had stormed through the upper bracket with his Cinder, while Wheels, the home-crowd favorite, was in his first-ever Combo Breaker grand finals. What resulted when these two clashed was some genuinely incredible Killer Instinct. Wheels, coming up from the lower bracket, established himself as a contender on Gargos, a gargoyle who uses summoned minions and long-range attacks to zone out opponents before closing the distance with his stone form. Wheels reset the bracket in a 3-0, with Valoraxe not seeming to have an answer to the gargoyle until the next round started. Valoraxe quickly did away with Wheels’ Gargos two games in a row, and on tournament point, Wheels made a switch to a new character: Sabrewulf, a KI classic. Commentators Sajam and TuboWare noted that Sabrewulf had been a trump card for Wheels in the past, and down to barely a sliver of health, Wheels pulled out an incredible win. The crowd on their feet, the battle was not over yet for Wheels, as Valoraxe was still one game up. Though Wheels managed to clutch out the game prior, he couldn’t hold back the patient and methodical Cinder play exhibited by Valoraxe. Under a wave of flames, Valoraxe took the last game he needed and claimed the Killer Instinct championship for the United Kingdom, 3-1. Combo Breaker 2017 is headed into its final matches now, with Guilty Gear and Vampire Savior on deck. If you want to catch the action, head over to the TeamSp00ky Twitch channel for more fighting game action.